As I’m sure everyone knows, Megan (my trainer and the farm owner) is moving to Tennessee, and Savy and I have to find a new barn. It’s going to be difficult to replace Bella Sera Farm. Bella Sera is a farm straight out of an 18th century fairy tale. The barn is open and bright, and has charming woodwork from the peg and hole ceiling to the “shabby chic” barn doors with 4 different paint colors showing through. 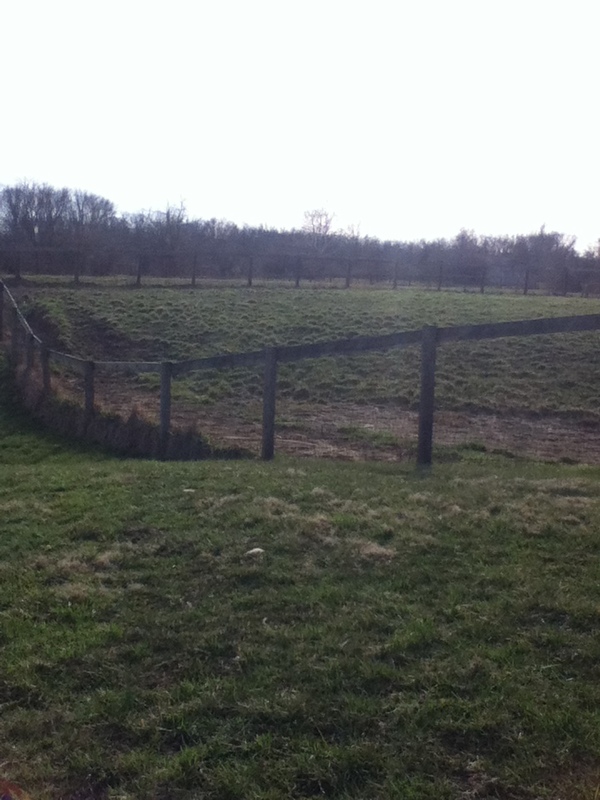 There is a beautiful tree lined alley which used to be the old road, acres of lush pastures, and a crab apple tree where Savy’s favorite grass grows. It’s a place where time stands still, the world melts away and it’s just you and your horse…and the barn cats 🙂 And of course the barn is filled with Megan’s spirit and love. Luckily Megan helped set us up with a magnificent trainer who happened to have a stall available for us…Savy and I moved to Nicole Harrington Dressage at Hunters Run Farm! The facilities are amazing, and the farm even has a few fairy tale touches, including a stream running through the pastures. Hunters Run also has an indoor arena and I can’t express how happy I am to be able to ride, rain or shine. Moving day was difficult. I woke up with a knot in my stomach, and because of work I couldn’t be there for the actual move. I must have checked my phone every ten minutes waiting for a picture or an update from Megan. It was killing me to think that my baby was standing in a strange stall scared and panicking. Luckily I didn’t have a reason to be worried. 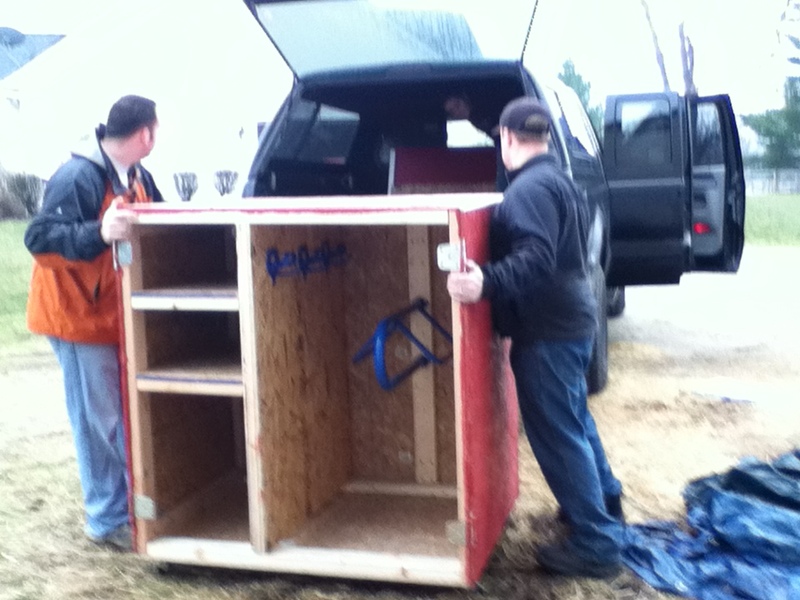 She handled to the move like a pro. 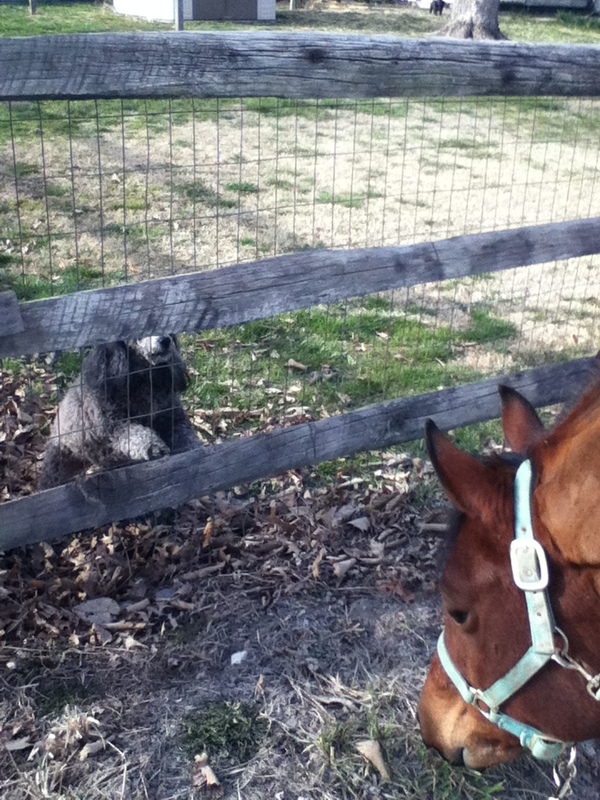 She settled in right away and started eating her hay and making friends with the new horses. 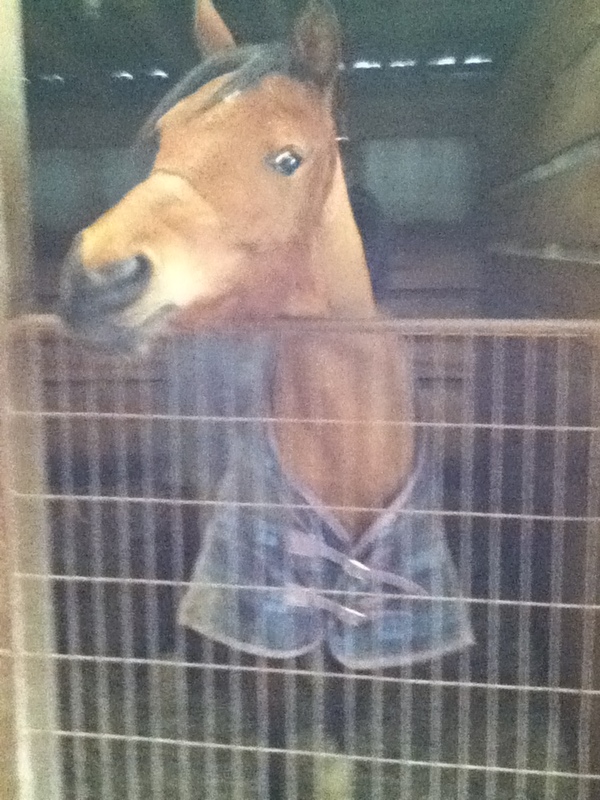 When I got to the barn later that evening, Savy stuck her head out of her stall with hay hanging out of her mouth, looking like she’d been born there. After I organized allll of my stuff (where does it all come from!!) 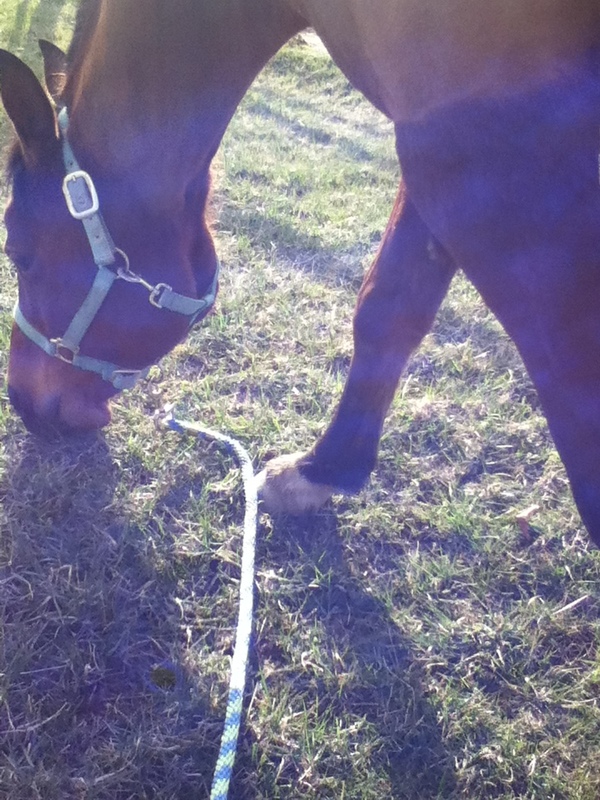 we took a walk around the farm and checked everything out; Savy smelled the water tank, all of the grass alongside the paddocks, the rubber footing in the arena and each jump standard and pole. Oh, and each pile of poop we came across. Girl loves her poop. 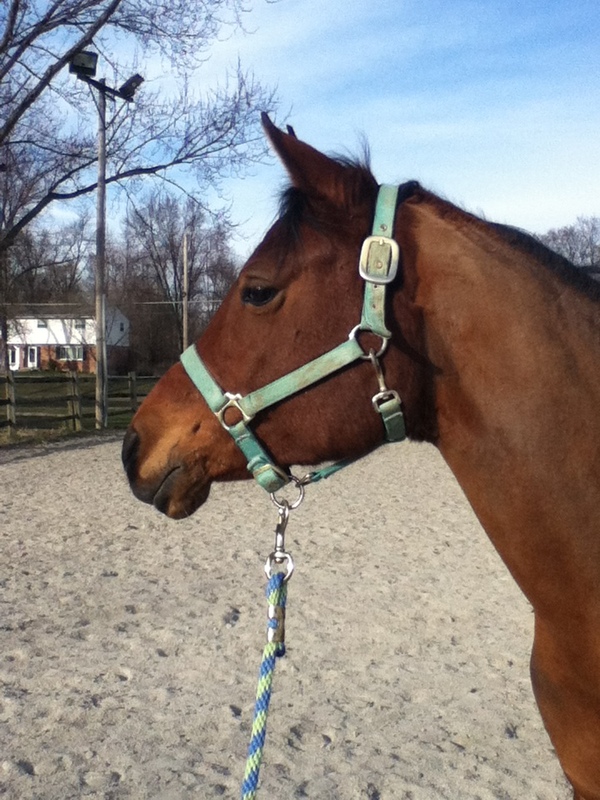 After getting a look-see, we saddled up and went riding. Savy was great! 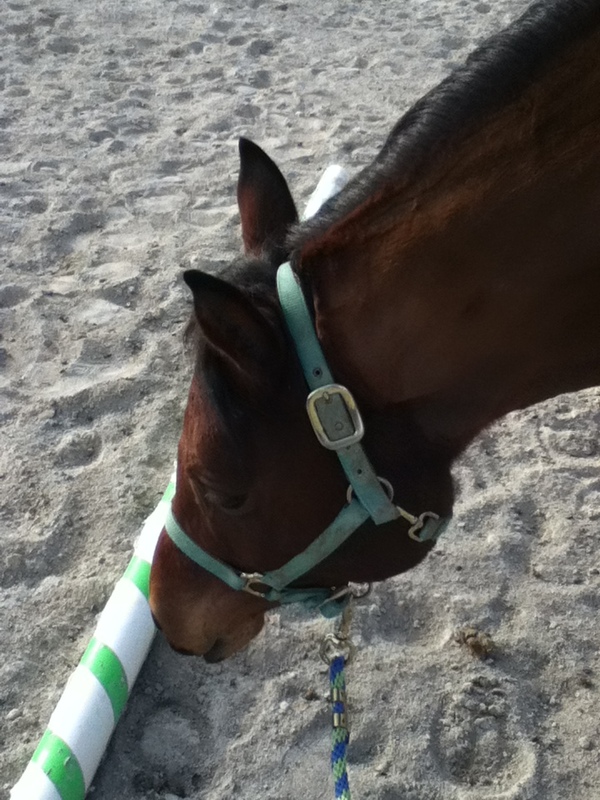 She was too curious about everything to get an attitude and apparently loves cantering in our new outdoor. I also realized that going someplace new is a lot easier on Savy and I than staying at Bella Sera is for Megan and Coco. 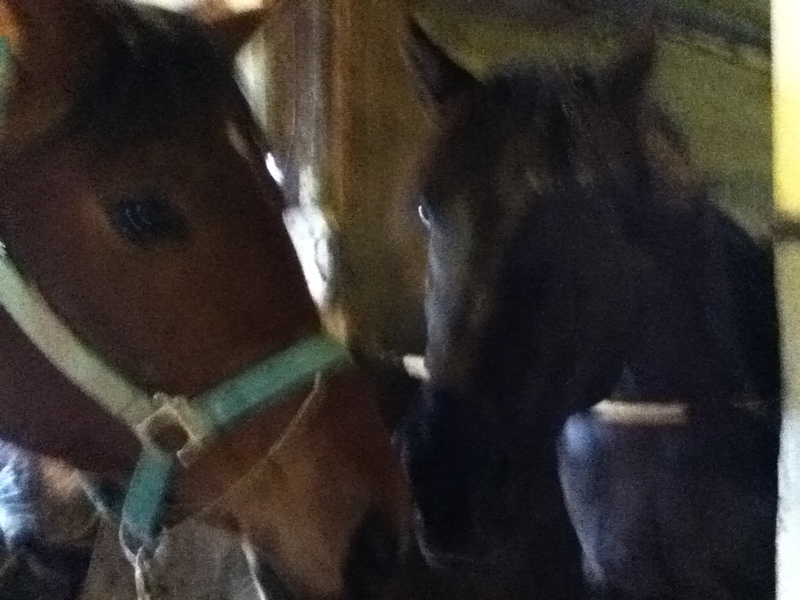 Savy and I have new people and horses to meet and new favorite grazing spots to find, Megan and Coco have to look at our empty stall and don’t have anything new to distract them. Until they move of course. The first day I moved Savy I stopped by Bella Sera to pick up a few things and I was so sad I could only stay a couple of minutes. 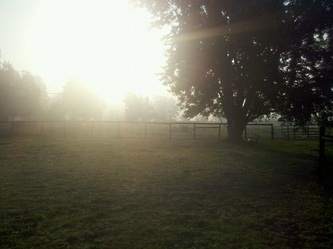 I already miss the farm, and the horses, and the cats. I don’t miss Megan because I’ve been stalking her ever since the move lol! 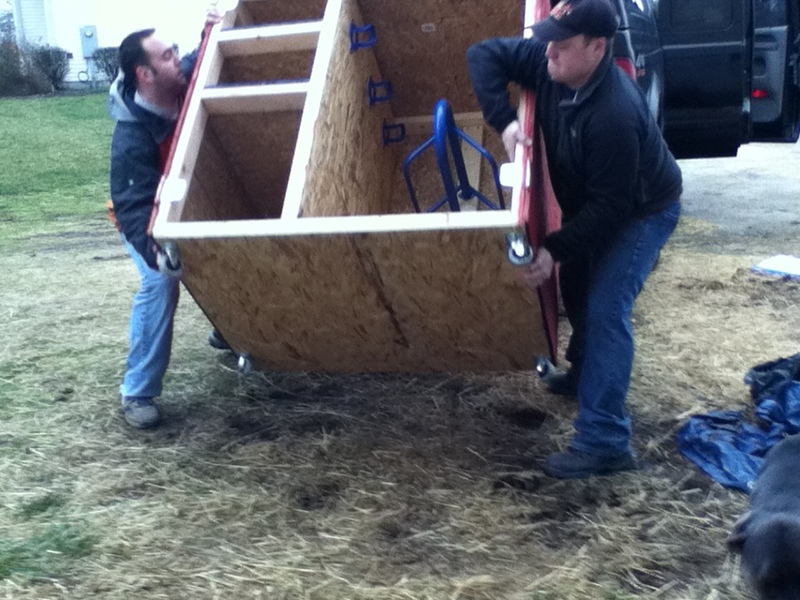 Here’s some pictures from moving day and our new barn…. Savy saying goodbye to Coco. 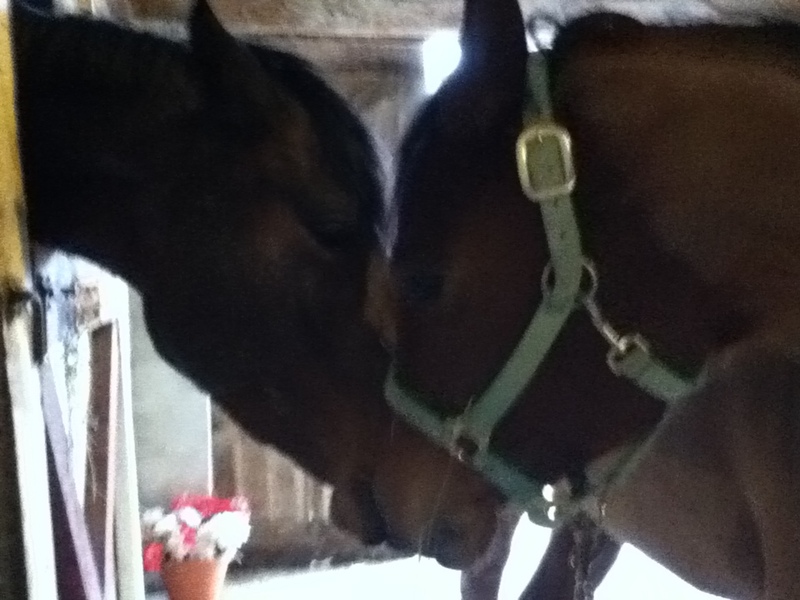 Coco and Savy are best friends, I can’t wait till they see each other at shows and when we go to visit in Tennessee. 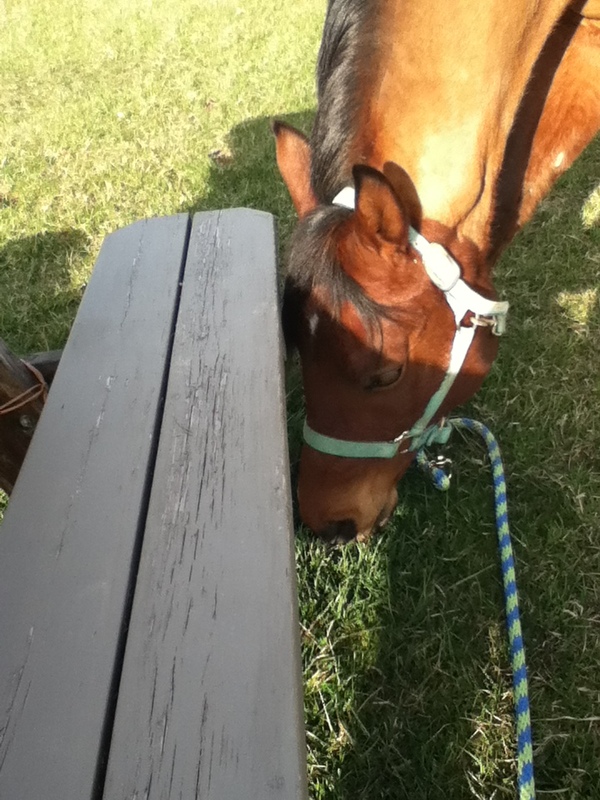 The good grass is under the bench! Ahhh! Hanging out in the sun!